Jess’ Teaching Session is no longer active. 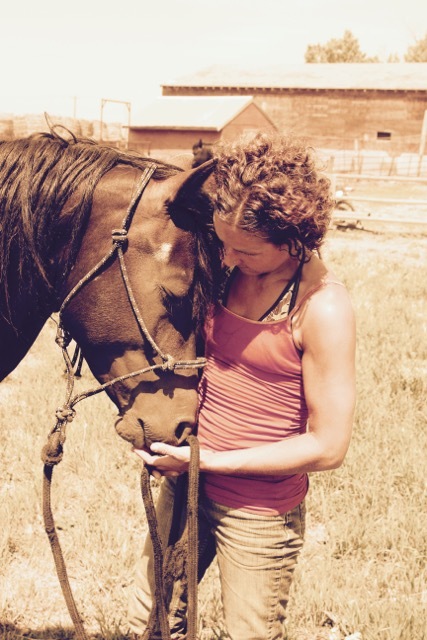 Jess Campmans is a farm wife, mother of 4, intuitive guide, equine guided facilitator, and energy healer. Horses have always been Jess’s life and soul’s passion, but until 2011 she had no idea that there was a way to marry working with horses and personal discovery, development, and healing. In fact, Jess had almost given up on owning horses at all, in spite of the fact that her family owned a herd of 15 foundation Morgans at the time. That year, it seemed that none of what she was doing with the horses’ training was working. In fact, it appeared the horses wanted nothing to do with her. Also, Jess was dealing with severe lower back pain and a host of gut and digestive issues. She hit rock bottom. A decision to open up to change ignited a complete shift into who Jess is today. Jess gained, not just mental knowledge, but all-body awareness that there is so much more than what we perceive. She gained wisdom and, through extensive EAP/L training and a myriad of mind/body trainings, an ability to access healing processes that affect the mind, body, spirit, and beyond, began to shape itself. Jess founded Guided by Equus, which focuses on a process to hold space and assist the healing process in both humans and animals. Jess is an intuitive and a healer; she is an open channel to the vibration of the horses and the natural world. The power of the infinite potential that is available to us is what the horses have led her to discover, and what she offers to her clients. Please check Jess out at Guided by Equus, email her at guidedbyequus@gmail.com, or call at 403.382.8110.